Cam Newton has thrown for 28 touchdowns and run for another 20 this season, leading Auburn to the SEC title. (CNN) -- Auburn quarterback Cam Newton won the 2010 Heisman Trophy on Saturday night, his on-field heroics enough to overcome off-the-field questions about his role in a purported pay-for-play scheme. On November 30, the NCAA cleared him to play -- one day after Auburn declared him ineligible because the interscholastic sports body had determined there had been a violation of amateurism rules. The NCAA changed course, it said, after concluding that Newton wasn't aware that his father, the Rev. Cecil Newton, and an unnamed owner of a scouting service tried to market the star quarterback "as a part of a pay-for-play scenario in return for Newton's commitment to attend college and play football." It has been widely reported that the school involved in the attempt was Mississippi State. The NCAA said that, given the information it had at the time, it did "not have sufficient evidence that Cam Newton or anyone from Auburn was aware of this activity." Auburn did limit Newton's father's access to its athletic program and Mississippi State has cut off relations with the other person, the NCAA said. The Rev. 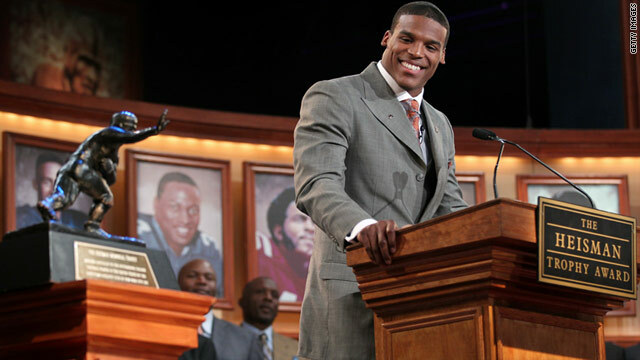 Newton did not attend Saturday's Heisman presentation, though Cam's mother, Jackie Newton, was in the audience.